The Fringe is a celebration of Sheffield as a diverse, welcoming and vibrant city. As anticipation builds ahead of the 10th anniversary of Tramlines, details have been announced for the Fringe at Tramlines event, taking place in the centre of the Steel City. 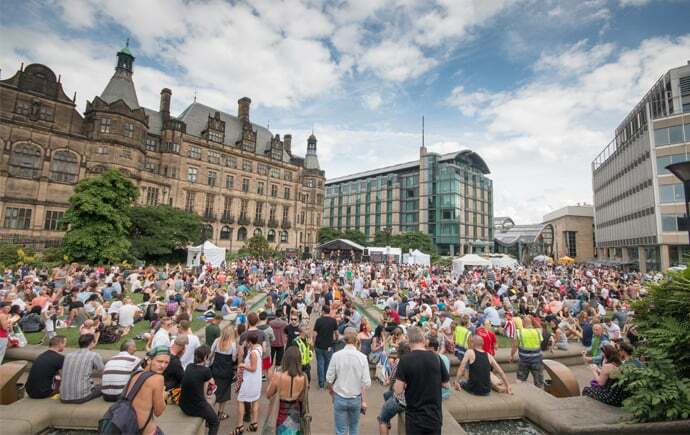 Organised by Sheffield City Council and Sheffield BID, The Fringe will bring live music, theatre and film screenings to the city centre during the weekend of 21 – 22 July. Devonshire Green will be taken over by The Fringe Stage, which will feature a Saturday line-up curated by Sheffield’s Papa Al, whilst Sunday will see Live Core Events bring an array of young and upcoming talent. Papa Al said: “After nine great years in the Peace Gardens we’ve moved up to the dizzy heights of Devonshire Green. My Saturday programme will feature a mostly Sheffield based line-up with a distinctly global flavour. The Peace Gardens will be transformed into an open air street theatre, including a street performance of The Boulders – a fusion of dance, parkour and bouldering presented by Professor Vanessa Toulmin from the University of Sheffield. The Fringe at Tramlines takes place on 21- 22 July, is free to attend. For more information, head over to www.sheffafter5.com/thefringeattramlines.